The most recent Boeing and Airbus passenger jets flying at present are built primarily from advanced composite materials such as carbon fiber reinforced plastic. These materials are very light, durable and capable of minimizing the aircraft’s overall weight by almost 20% compared to aluminum-bodied planes. Using these lightweight airframes directly leads to fuel savings, which is a key plus point in modern composites’ favor. However, composite materials are also vulnerable. Although aluminum is capable of handling relatively large impacts before cracking, the several layers in composites can crack due to comparatively small impacts. This drawback is considered the Achilles’ heel of the material. Recently, aerospace engineers at MIT have discovered a method to bond composite layers in way that the ensuing material is significantly stronger and highly resistant to damage compared to other advanced composites. Their research findings have been published in the Composites Science and Technology journal. The MIT researchers bonded the layers of composite materials together with the help of carbon nanotubes, which despite their microscopic stature are extremely strong. They embedded minuscule clusters of carbon nanotubes inside a glue-like polymer matrix. The matrix was then placed between layers of carbon fiber composites and pressed. The nanotubes, looking like miniature, vertically-aligned stitches, worked themselves inside the crevices of each composite layer, acting as a scaffold to hold the layers together. The team discovered during the experiments to test the strength of the material that compared with currently available composite materials, the stitched composites were 30% stronger, enduring greater forces before cracking. Roberto Guzman, an MIT postdoc in the Department of Aeronautics and Astronautics (AeroAstro) led the team, stated that the enhancement could pave the way to stronger, lighter aircraft components - specifically those that need bolts or nails, which can fracture conventional composites. More work needs to be done, but we are really positive that this will lead to stronger, lighter planes. That means a lot of fuel saved, which is great for the environment and for our pockets. The co-authors of the research paper include AeroAstro professor Brian Wardle and researchers from the Swedish aerospace and defense company Saab AB. This glue area has been reinforced several times using 3D weaving and Z-pinning, which are techniques that consists of weaving or pinning bundles of carbon fibers via composite layers, in the same manner as pushing thread through fabric, or nails through plywood. By contrast carbon nanotubes are just 10 nm in diameter - about a million times smaller than the carbon fibers. Size matters, because we’re able to put these nanotubes in without disturbing the larger carbon fibers, and that’s what maintains the composite’s strength. What helps us enhance strength is that carbon nanotubes have 1,000 times more surface area than carbon fibers, which lets them bond better with the polymer matrix. Guzman and Wardle created a method to combine a scaffold of carbon nanotubes within the polymer glue. Initially, they grew a cluster of vertically-aligned carbon nanotubes. Next they performed a procedure that Wardle’s team had developed earlier. They then moved the cluster onto a sticky, uncured composite layer and performed the process again to produce a stack of 16 composite plies - a standard composite laminate structure - with carbon nanotubes glued between each layer. To test the strength of the material, the team conducted a tension-bearing test, which is a standard test used to size aerospace components. The researchers placed a bolt via a hole in the composite, and then ripped it out. While currently available composites usually break under this type of tension, the team discovered the stitched composites were stronger, and could endure 30 % more force before cracking. The MIT team also conducted an open-hole compression test, applying force to press the bolt hole shut. Here, the stitched composite endured 14% more force before cracking, compared to currently available composites. The strength enhancements suggest this material will be more resistant to any type of damaging events or features, and since the majority of the newest planes are more than 50 percent composite by weight, improving these state-of-the art composites has very positive implications for aircraft structural performance. Stephen Tsai, emeritus professor of aeronautics and astronautics at Stanford University, states that modern composites are unparalleled in their ability to decrease fuel costs, and thus, emissions from airplanes. 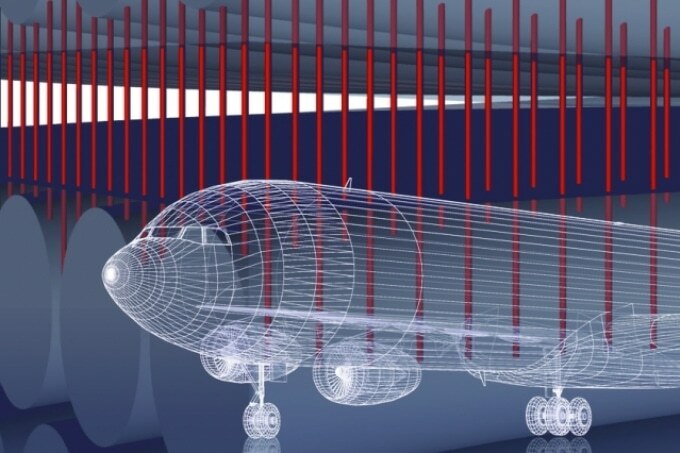 This work was supported by Airbus Group, Boeing, Lockheed Martin, Saab AB, Spirit AeroSystems Inc., Textron Systems, Embraer, ANSYS, Hexcel, and TohoTenax through MIT's Nano-Engineered Composite aerospace STructures (NECST) Consortium and, in part, by the U.S. Army.